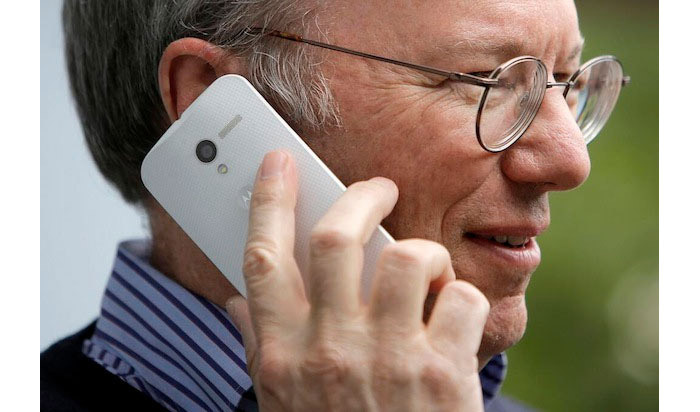 The CEO of Google – Eric Schmidt – has been seen using a new unknown device but tech savvy users have been quick to point out that the device in question is the rumored Motorola Moto X smartphone. Schmidt was seen using the device at the Allen & Company Conference 2013. When asked Mr. Schmidt declined to comment on the device or share some more details about it but the preliminary photos of the Motorola Moto X smartphone are just like the device in question – so here it is. Unofficial smartphone specs suggest the Motorola Moto X to have a 4.4-inch display at 720p resolution, a 1.7 GHz Qualcomm Snapdragon S4 Pro processor, a 10 MP rear camera, 2 GB of RAM and Android 4.2.2 Jelly Bean although there’s a chance for the Motorola Moto X to arrive with Android 4.3. The new smartphone is expected on August 28. In the USA Verizon will sell the device.